Both the materialist and the ascetic seek for knowledge in their own ways. The materialist analyses facts and interprets them to construct hypotheses. However the interpretations are not infallible and go on changing as the materialist world-view goes on expanding. Naturally Science has to go on modifying its constructs, hypotheses, laws, theorems, formulas. The ascetic, the mystic, the spiritual seer seeks to realize the essence of existence, the raison d’être of creation, the epitome of Consciousness. In the process, he either exhausts or transcends his cognitive repertoire to discover that the Absolute is beyond what we can ever know and also beyond what we can not forever know. 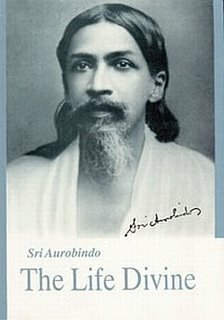 However Sri Aurobindo points out that both the unreality of the appearance (as acknowledged by the Illusionist) and the unknowableness of the Unknowable can be exaggerated. What is unknowable may be beyond the grasp of our thought and speech but never the less can be attainable by a supreme effort of consciousness. Actually, the spiritual paradigm has been continuously developing and perfecting a ‘technology’ of consciousness to know the Unknowable. This pursuit led to the development of ways and means of acquiring knowledge that transcends sensory perception and logical thinking without belittling them. These “suprarational ways” of acquiring knowledge are elaborated in details in subsequent chapters of The Life Divine. Sri Aurobindo speaks about a ‘kind of Knowledge which is one with Identity’. This is not a fiction if we consider that even in our ordinary lives, we can ‘know’ movements like ‘anger’ or ‘love’ by identifying with these states. Of course one has to cultivate a poise of detachment in one part of the mind so that one can stand back and identify with one’s own external movements. The yogi develops this technology of ‘identity’ with the deeper and higher levels of Consciousness. In the process of developing and probing the inner ranges of consciousness, the individual can ‘identify’ with the Universal and Transcendental Consciousness. Why? This is because of the Indian spiritual realization that the microcosm is represented in the macrocosm and the macrocosm is represented in the microcosm. In other words it is the same Consciousness that is represented in different poises—individual, universal (cosmic), and transcendent. Therefore if one comes into contact with the essence of one’s own individual consciousness, one can, with the correctly cultivated technique, come into contact with the essence of the universal as well as the transcendental consciousness. a) It gives credibility to the process of acquiring knowledge by ‘identity’. b) It justifies the ascending movement from the ‘finite’ to the ‘infinite’. This makes it worthwhile for the human being to aspire and yearn for the Godhead. c) It justifies the descending movement of The Godhead to the human aspirant. This is the genesis of ‘Grace’. d) It generates the ‘Consciousness’ paradigm that links the microcosm and macrocosm. e) It justifies Sri Aurobindo’s concept of ‘transformation’ of ‘consciousness’. As the Higher Reality (the macrocosm) is represented in the lower earthly Reality (the microcosm), it is possible to transmute the lower Reality in terms of the Higher Reality. In other words, ‘Spirituality’ can manifest in ‘material’ life and “Matter” can reveal the “Spirit’s” face. That is the aim of The Life Divine. a) Once the Integral cognitive field (Supramental cognition) manifests and gets stabilized, newer processes of Knowledge will be triggered off. b) The Integral or Supramental cognition can not have any value unless it moves out from the mere status of Knowledge and dynamises itself at the levels of ordinary Mental cognitive field and also radically transmutes the infra-cognitive matrices of Life and Matter. Time travels towards revealed eternity. An occult document of the All-Wonderful’s art. In all we feel his presence and his power. A glory is his dream of purple sky. A march of his greatness are the wheeling stars. Are murmurs falling from the Eternal’s harp. This world is God fulfilled in outwardness.